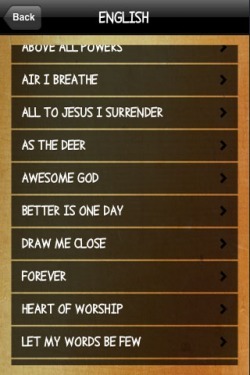 Worship Song Book iPhone app lets you carry choosen lyrics of worship songs generally sung in churches on your iPhone. 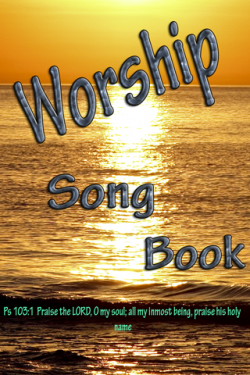 - Have your songbook in your pocket.Carry choosen worship song in ur iphone/ipod. - You can use this app in your church worship service or at you home prayer meeting. - Currently this app has more than 200 songs in 3 different languages. i.e English,Hindi,Malayalam. Would like to see more songs? - You have chance to request a song or language and we could add them for you. - More songs or more languages based on popularity could be added to the existing list. - Shake your Iphone to change the bible verse on the main screen. - Receive inspiring verses from Bible each time you switch on. If you wish to create an app specific for your church with your choice of worship songs please contact us at at yeshusavior@gmail.com. Any suggestions and comments are welcome.